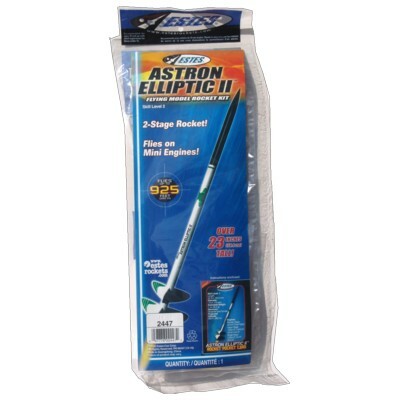 The Astron-Elliptic II is a mini-engine powered two-stage rocket which comes with low-drag elliptical shaped fins and aerodynamic styling, enabling you to fly this bird to altitudes approaching 280 metres! Tumble recovery brings the lower stage back to earth while the upper stage is recovered via streamer. Waterslide decals included. Fit the Altimeter One unit (inside this model and see how high you can go!